You guys, I promise. This pasta is way better than it looks. Some foods looks especially pretty on camera (i.e ravioli, cookies, bagels) and some foods just don’t. I think this is one of those foods. But it tastes good. Really good. Homemade buffalo sauce mixed with cheddar cheese and blue cheese to create a creamy and delicious alfredo-like sauce! One word. Yum. I am embarrassed to say how easy this pasta is. It comes together in less than and hour! But with all the hustle and bustle of the holidays I figure it is perfect for those busy holiday weeknight’s we are all experiencing right now. It gives extra time to make all those yummy Christmas treats we have been dreaming about all year! 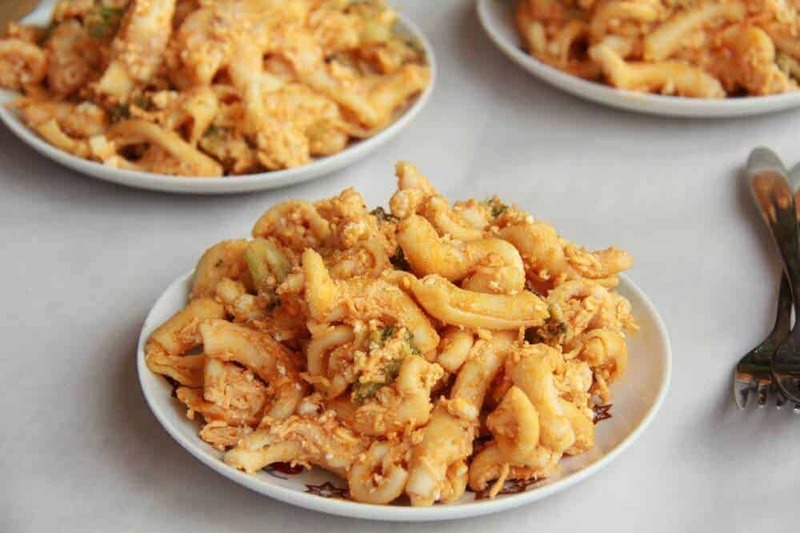 I used a fun, new to me, pasta shape (Gigli), but you could use any pasta you would like. I bet even fettuccine would be great! 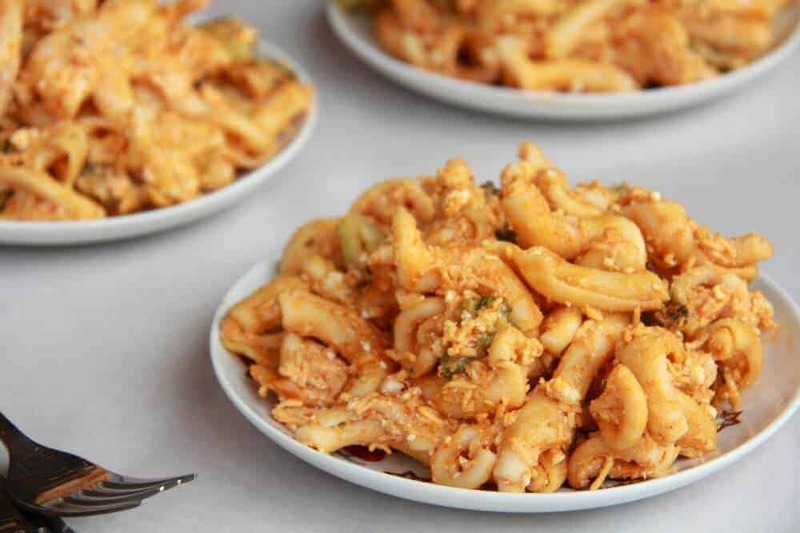 What ever you do you should make this pasta…….then you won’t feel so bad about downing all that cookie dough! 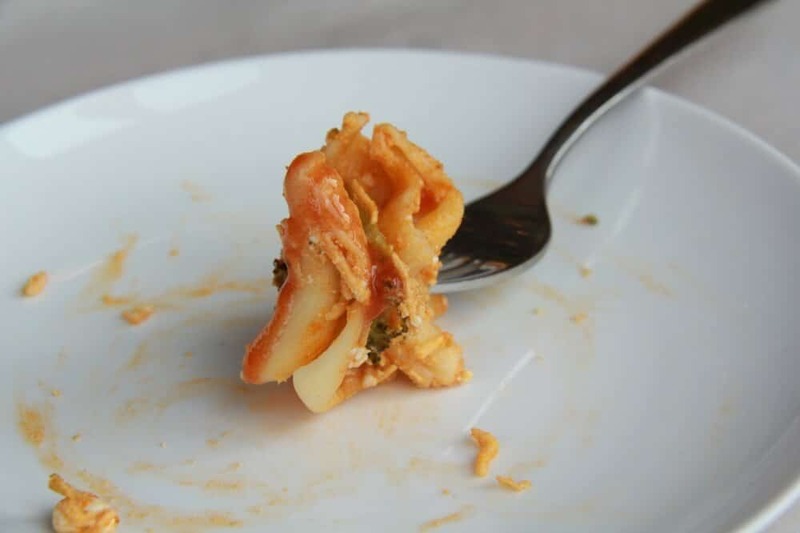 This pasta tastes good. Really good. 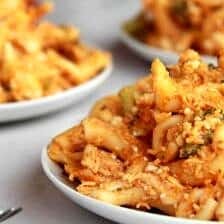 Homemade buffalo sauce mixed with cheddar cheese and blue cheese to create a creamy and delicious alfredo-like sauce! One word. Yum. Toss the broccoli with olive oil, salt and pepper. Roast for 25 to 30 minutes or until it begins to brown and caramelize. While the broccoli roasts make the sauce. In a medium sauce pan over medium heat melt the butter. Add the cream cheese and whisk until combined. Add the milk, hot sauce, and seasoned salt. Bring to a boil and then remove from heat. Stir in the cheddar cheese until melted. If needed return to the stove to fully melt the cheese. Toss in the blue cheese. Boil pasta according the package directions. Before draining the pasta reserve 1 cup of the pasta water. Place the hot pasta in a large serving bowl. Pour the sauce over the pasta and toss. If needed add some of the pasta water to thin the sauce. Add the roasted broccoli and toss to combine. 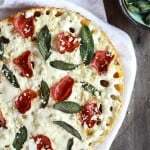 Serve hot with extra blue cheese. OMG, 15 days till Christmas? How did that happen…. 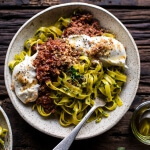 Chorizo Bolognese Pasta with Sourdough Pangrattato + Burrata. 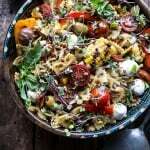 Everything But the Kitchen Sink Pasta Salad. 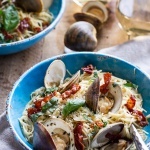 Fresh Clam Pasta with Creamy White Basil Sauce + Crispy Prosciutto. I really really want this for lunch today! I think that I am going to have to put this on the shopping list!! Ya! So glad you like it! 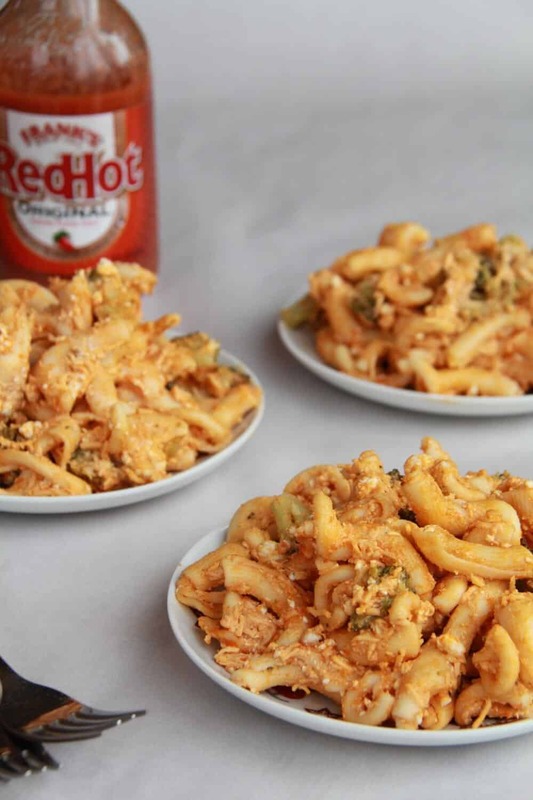 We’re all about the buffalo-style anything and this looks super yummy! I love anything buffalo and so does my husband. This looks SO good! Thank you! It is really delicious! look’s good! pasta is one of my favourite food. THanks for sharing with us at FFF this week. That looks delicious, I like how you have the hot sauce ready to put on it! Wow – this looks delicious! Thanks for bringing this to Tuesday’s Table – hope you come back next week! I just saw this at the Weekend Potluck. I love most anything with hot sauce, this is no exception…yum! 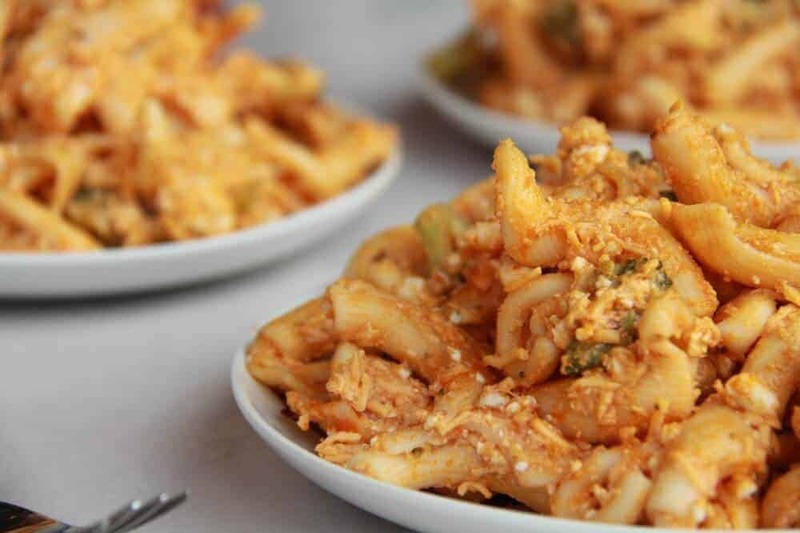 We are pasta fiends in this house, and yours looks super yummy! Thanks for sharing at Church Supper. Have a blessed week, Merry Christmas and Happy New Year! Oh I love this one so much, I will be making it this week! Well it may not look pretty but ti sure does sound good! I’vew added this to my menu for the week. I cant wait to try it. I’m featuring this this evening over at Whatcha Whipped Up. Thanks so much for sharing and I hopr to see you there again this week! This sounds really yummy, I bet my husband would love it! Oh YUM! I am definitely making this! This would make for a great “game day” meal. I added store-bought roast chicken and would double the broccoli and cut the sauce portion in half. My kids love spicy so this was a hit. My eyes watered a bit (I’m a light weight) so I cracked open a cold beer and it was the perfect complement! I made this, and while it tasted very good, it was way too salty even before I added the blue cheese. I made some buffalo chicken meatballs with Frank’s over the holidays and had the same problem. I wonder if there is a just as tasty but less salty hot sauce that would work well? The other brands that I had were too vinegary to be a good substitute. Anyway, the second night I had it I paired it with a salad, which helped quite a bit. I want to try making it again though. Good recipe, as always!